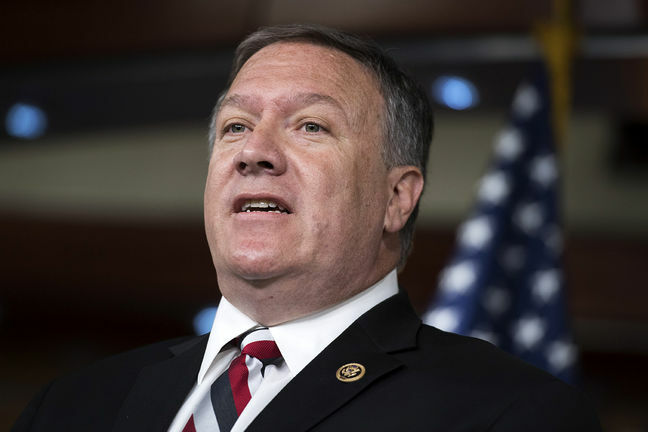 EghtesadOnline: The United States is still studying possible waivers of sanctions against countries or businesses that continue commerce with Iran after Nov. 4, US Secretary of State Mike Pompeo said on Friday. At the same time, he maintained the US administration’s firm position toward Tehran, AFP reported. To the dismay of other signatories, Trump in May announced his pullout from the hard-won 2015 international accord under which Tehran agreed to limit its nuclear capacities in exchange for relief from crippling economic sanctions and reimposed sanctions against the country. Businesses or foreign countries, which continue commerce with Iran, must now choose between their investments in Iran and their access to the US market, according to Financial Tribune. Washington gave them some time to pull out, leaving the latest sanctions related to financial transactions and petroleum to take effect after Nov. 4. Washington wants all countries to halt oil imports from Iran before November 4, if they want to avoid US penalties. Certain waivers have not been excluded, however, notably for India which depends heavily on Iranian petroleum. “Come November 4th, there will be a fundamentally different set of rules” regarding “anyone who deems it necessary to engage in economic activity with the Islamic Republic of Iran. It is a big important day,” he said. Pompeo underlined that many countries had already begun to disengage themselves. The three countries could set up a “Special Purpose Vehicle” (SPV)—a firm resembling a clearing house that would cut Tehran out of the financial loop while still allowing trade, news weekly Der Spiegel and business daily Handelsblatt reported. For example, Iran could ship oil to a Spanish firm, accumulating credit that could be used to pay a German machine-tool manufacturer for goods going the other way—without any money passing through Iranian hands. Spokespeople for the German economy and finance ministries told AFP the scheme was one of several options capitals are discussing with the European Commission to create “independent payment channels” to Tehran. European Commission Spokeswoman Maja Kocijancic said Brussels wants “to make sure the effects of the sanctions are minimized for companies that want to do legitimate business with and in Iran and they can still have access to necessary finance”, adding that the work is currently continuing. Banks that usually execute payments in international deals fear themselves falling foul of American reprisals, if they continue to enable business with Iran.